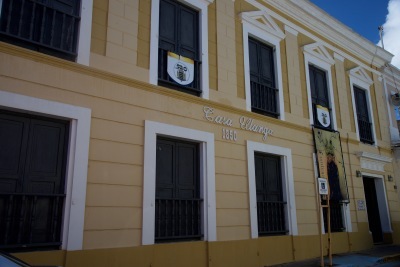 In 1841 the Hacienda Cambalache was owned by Francisco Ulanga de Chavoni (1801-1860) and his brother-in-law Manuel Figueroa. Ulanga was a Spanish immigrant from Santander who arrived in Puerto Rico in 1810 and established Casa Comercial Ulanga or Ulanga & Cia., a firm dedicated to the sale of agricultural supplies and equipment and provide financing for agricultural activities located in the lower floor of his house, which was included in the National Register of Historic Places in 1982. ​After Ulanga's death in 1860 the Hacienda was acquired first by C. F. Storer & Cia. and then by Edmund Pavenstedt, owner of Central Los Caños . In 1905 Antonio Figueroa and Andrés Oliver Roses of the firm Sucrs. Roses & Cia., owners since 1889 of Ingenio Santa Barbara , established Central Cambalache, Inc., the consolidation of Ingenio Santa Barbara with other haciendas in the area including Hacienda Buena Vista, originally owned by the Watlington brothers, Hacienda Las Claras of Francisco Stuard and Hacienda Cambalache. After the interim presidency of Manuel Ledesma, in September 1906 José Figueras was named Chairman of the Board of Directors and in 1907, Luis Rubert and Agustín Plá were added as Board Members. The Gaceta de Puerto Rico in its edition of May 9, 1906 reports that "We are told that the company owner of the new Central Cambalache has acquired by puchase from the Sucn. Fernandez the Central Las Claras." In 1910 Central Cambalache, Inc. paid $250,000 to acquire Central Oriente for its lands and sold its machinery to the newly established Central Alianza of the Oliver family. The Louisiana Planter and Sugar Manufacturer edition of November 4, 1911 states: "Central Cambalache near Arecibo is a central that has had a phenomenally successful career since its inception about 6 years ago when a syndicate of local capitalists purchased some old machinery in Ponce, transported it to Arecibo, supplemented it with a fine Krajewski mill and crusher and began to make money." The article also states: "Unfortunately the business got too big for the management and the past crop was a big failure due entirely to want of experience and technical advice. The $1,000 shares which had reached the market value of $2,000 in the San Juan Stock Exchange suddenly tumbled to about $1,400. it is reported that Don Eduardo Georgetti has bought a large interest in this company and it is to be expected that he will see that in future competent advice is taken regarding the machinery. The mistake is too frequently made in Porto Rico of purchasing new machinery without seeing that the rest of the factory is in proportion." During the 1930s the main stockholders of Central Cambalache, Inc. were; José Matienzo Lezcano, Angel Abarca (who also had ownership interest in Central Plata ), Jose. R. Oliver, Vitaliano Garcia and Jose Matienzo, Jr.
Based on average annual production, Cambalache was at one time the fourth largest producing sugar mill on the island and in 1931 was the largest sugar mill on the north coast. Throughout the years, it continued to acquire land for harvesting including haciendas San Francisco and La Vega from Sucn. Gregorio Ledesma and at one point owned approximately 10,000 acres, all dedicated to the growing of sugarcane. It was one of the few locally owned sugar mills that had its own railroad system. Title I: Created the Land Authority to administer the programs established. Title II: Dealt with the financing of the land program. Although the law allowed Federal Aid if same was offered, it relied on insular appropriations and borrowings. The Land Authority was authorized to issue bonds of the people of Puerto Rico up to $5 million, the first funding was $2 million in 1941. Title III: Regulated Land acquisitions by authorising the Land Authority to institute legal proceedings for the expropriation of land in excess of 500 acres by non-natural persons and acquire without public auction all lands placed under receivership as a result of the 500 acre law convictions. Title IV: Established the Proportional Profit farm program which would rent 100 to 500 acre farms to willing farmers who would manage them on a fixed minimum salary and a profit sharing basis. Title V: This was the program for resettlement of the "agregado". This was a program of plot distribution under which each agregado would receive in usufruct a "parcela" of up to 3 cuerdas for his house and small garden to augment his salary. In December 1941 the Land Authority paid $41,838 to purchase 482 cuerdas of good land in Barrio Sabana Seca of Toa Baja from Manuel Gonzalez to relocate evacuees from land seized by the Navy for a military base. The first acquisition from a corporate owner was in August 1943 when Central Cambalache, Inc. signed a consent decree to sell 9,519 cuerdas to the Land Authority for $1,593,365. In 1945 The Land Authority acquired the sugar mill. 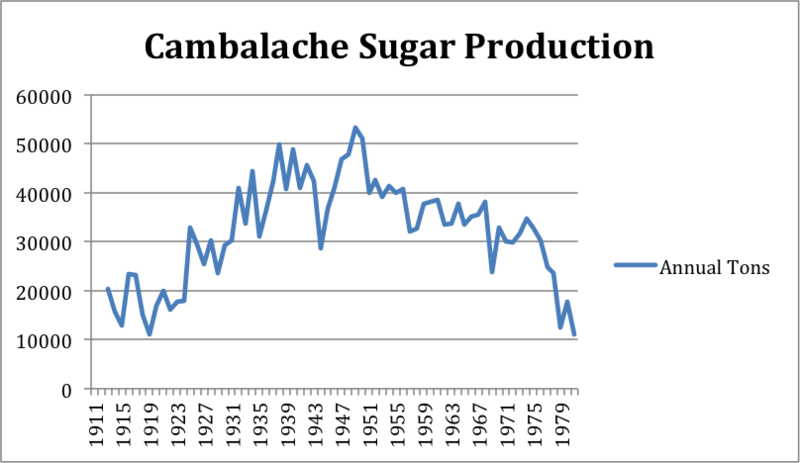 Its downward production trend started in 1950 as opposed to the combined trend of all 32 sugar mills operating at the time which started 3 years later in 1953. On October 28, 2002 the Puerto Rico Legislature approved measure 970 declaring the two smoke stacks, the boiler, the "structural" skeletons of the main buildings and the " batey " of Cambalache as Historical Monuments. Despite this, most of the remains were demolished in 2010 also by the government or under government approval. Although it may exist, we did not see the "batey". What used to be part of grounds of this sugar mill are now being used by the Puerto Rico Electric Power Authority. The remains include a house that was most likely used as the residence of one of the administrators.